The Township of Washington Police Department has been designated as a permanent site for the collection of unused, expired and unwanted prescription medications. For safety reasons, we only accept solid medications such as pills, patches and inhalers. We do not accept liquids or syringes. If you wish to dispose of liquids or syringes please contact your doctor or pharmacist to find how to dispose of those items correctly. The Township of Washington Police Department is proud to be working in conjunction with the Drug Enforcement Administration and the New Jersey Department of Consumer Affairs. We are one of only 30 permanent sites in all of New Jersey. 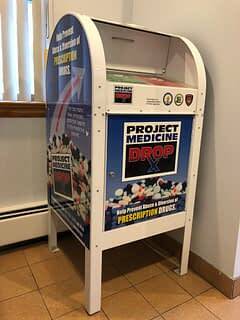 The drop box is located in the Township of Washington Police Department lobby, located at 350 Hudson Avenue, Township of Washington, NJ.